I love me a good stir fry, I love adding whatever vegetables I happen to have in the fridge and mixing it up into a sticky, savory goodness. This isn’t spicy, but you could easily add more red pepper flakes (or some kind of spicy Thai paste) to make this as hot as you’d like. J-Mo prefers his food with as much spice as possible, I am just getting used to eating “medium” salsa. So, we compromise. I add lots of flavor, and he adds the Sriracha after he dishes up. You can use pork or chicken for this dish, and you can add just about any veggies you’d like: carrots, sliced zucchini or yellow squash, diced jalapeno if that’s how you roll, and you can sub peanuts for the cashews if you have those in your pantry instead. Serve this over white or brown rice, or you can use cauliflower rice, which is what I did. Take a head of cauliflower, chop out the steam and cut the rest into big pieces. Run them through a food processor (I have a non-fancy $20 dollar one, like this) until you have a mealy texture. Put it all in a large glass bowl, sprinkle generously with salt and white pepper, and put in the microwave for 8-12 minutes, stirring once in the middle. DO NOT add liquid, there is plenty of water in the cauliflower to steam itself in the microwave. The trick to stir fry is that you need to prepare all your ingredients before you start cooking. The cooking part takes maybe 7 or 8 minutes total, but it takes some time to assemble the ingredients, chop the veggies, stir up the sauce, etc. Basically, you want to pretend you’re on your own cooking show with all your ingredients in cute little prep bowls…or washed out sour cream containers (which is what I use because I am so not fancy enough for a matching set of cute little prep bowls). You also want your meat to be partially frozen so you can slice is super thin. You can put completely thawed meat in the freezer for about 5 or 6 hours, or you can partially thaw frozen meat, whatever works for the current thawed/frozen situation you have going on. Start cooking your rice or cauliflower-rice. Chop everything and set aside. 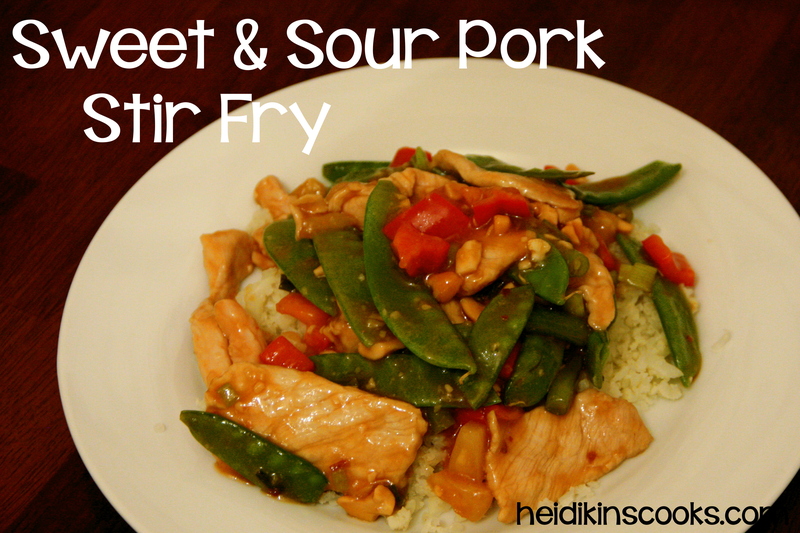 Stir fry has different cooking times for different ingredients, you can combine the onions, ginger, garlic, and green beans in 1 sour cream container prep bowl, and the pineapple, snow peas, and bell pepper in another. The cashews you’ll add at the very end, so keep those separate. Whisk this all together in a small bowl and set aside. Slice your partially-frozen pork as thin as you can. Plop it into a bowl with the cornstarch and pineapple juice and stir until it is well coated. Set aside. Place a large skillet or wok on the stove on medium-high heat. While the pan is getting hot take a few minutes to clean up your work area (unless you are one of those who has more than 24″ of usable work space in your kitchen, you lucky duck), and get your veggies, sauce, and meat within reach of your stove top. When the pan is hot heat 1-2 TB oil (canola is preferred, but I use olive oil and have never noticed a difference). When it is piping hot and starting to spit dump in the meat and cook 3-5 minutes until it is mostly done (a little pink is okay, you’re not done cooking it yet). Add the onions, garlic, ginger, and green beans and stir fry for another 2 minutes. Add the red pepper, snow peas and pineapple, stir fry for another 2 minutes. Whisk your sauce again and add it to the skillet, stirring constantly until it boils. Cook another minute, throw in the cashews and remove from heat. Serve over rice, garnishing with additional nuts or green onions (or Sriracha, if you like). *If you are adding carrots I’d slice them very thin and add with the green beans, or you can pre-cook them a little in either the microwave or a small saucepan on the stove. The carrots are so hard they will still be crunchy in this shortened cooking time. I think if you used the carrot matchsticks you’d probably be okay without pre-cooking. If you are adding softer veggies like yellow squash or zucchini add them with the snow peas and pineapple. I made this for dinner tonight, and WOW, Heidi! It was soooo good! Tim and I both loved it. It’s definitely a keeper for us.